As if it wasn’t bad enough last week dealing with the peeps, this week is just… too much. Although the picture I originally received was for the red variety (oh, forgive me, “strawberry flavor”), Raquel mentioned that she had also spotted blue and green varieties. My curiosity piqued, I asked her if she would be so kind as to go on special assignment for me and find out more details, since Internet searches about this foolishness brought up not one iota of information.Given the nutrition information on the front of the package, I guessed that this snack (?) was probably nothing more than cornstarch and artificial sweeteners. Got a Weekend WTF?! to share with the class? Send it over to wtf@blackgirlsguidetoweightloss.com! Weekend WTF Easter Edition: Curse Those Wretched Marshmallow Peeps! Weekend WTF: Accidentally Vegan Meat Product? 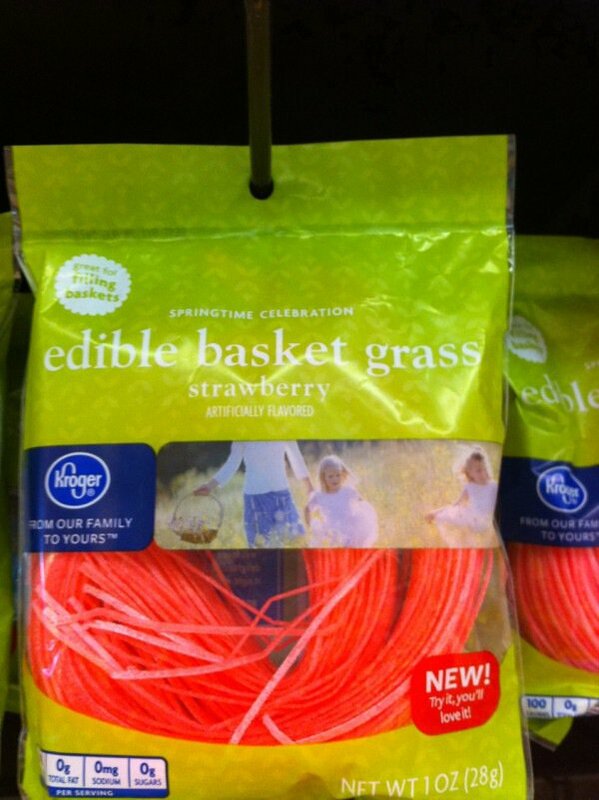 Actually I always wanted easter basket grass that you could eat when I was growing up…. sorry. I would curse the grass because it was nothing but useless fluff. I used to love love love spinning sugar just for the fact that to me it was like easter basket grass. However I would never eat this as a adult nor would I ever let my future kids eat it. I’d rather have the spun sugar or maybe some fruit leather strips cut in long thin julienne slices. Actually I think I might get some of this stuff. Not for my kids… if I didn’t tell them it was edible it probably would never occur to them to try. But for my cat! She has been hacking up Easter Grass hairballs all week… at least this stuff will break down in her system! Too bad it has aspartame though… I am not a fan of poisoning the little beings in my care! The edible grass doesn’t shock me as much as the fact that when the woman went back to the store to find some, it was sold out. The more I read about clean eating and nutrition, the more I realize that most people don’t THINK when they buy food for themselves and their children. Next year they’ll have edible Easter baskets that come in edible packaging and people will LOVE IT.